When I got the review request, I was so fascinated by the description that I scurried off to Goodreads to go through the reviews. Except, to my irritation, I never found a Goodreads page. Having read the book now in one very exciting sitting, I am even more annoyed, because The Great Mogul by Rajeev Jacob is a unique read. I really wouldn't want it to disappear among the hundreds of mostly mediocre books that the Indian publishing industry churns out every year. The Great Mogul is, in its own delightful and rather eccentric way, awesome. I admit, the book is hardly perfect, but it is well crafted and engaging. Summary: The Great Mogul is a 900 carat diamond which was last seen by jeweller Travenier in the hands of Mughal Emperor Aurangzeb in the seventeenth century. There have been no sightings of it since then leading historians to conclude that it has been either cut up, misplaced or lost forever. The lives of the beautiful but much abused Khyrunissa, the thieving but loyal Bhaichand and the murderous but love-lorn English mercenary David Washerby are inextricably linked in this searing tale of love, greed, ambition and betrayal. Two young scholars delving into the role of mercenaries in eighteenth century Indian wars discover more than just pages out of history. Through the world of musty old archival records and clues hidden in a minor British poetess’ love lines, Irene and Jason find themselves chasing the elusive trail of The Great Mogul – one of the world’s largest and India’s greatest diamonds, the brilliance of which is matched only by the depths of mystery surrounding its current whereabouts. Along the way, they find out more about a dissolute English mercenary’s perilous and exciting quest to seek a great fortune. A journey that takes him across the length and breadth of India and nearly leaves him dead. My thoughts: The Great Mogul by Rajeev Jacob is a diamond in the rough (see what I did there?) There are goods and bads, but the goods definitely outnumber the bads. That being said, I do hope that the person in charge of the editing does a better job the next time. What I liked: The blunt writing style is the first thing that caught my attention. The descriptions are vividly crude, though I actually enjoy the uncompromising honesty. The hunt for a diamond could have been grossly sensationalized, but this book is firmly realistic, with maybe just a dash of the necessary drama. I like the intermingling of the two periods; we learn what happened in David's times and at the same time watch as Irene and Jason, the two young scholars, dig into history. While the past is undoubtedly thrilling, the present too is harrowing, in a different manner, of course. Research is not easy, and it would have seemed very unlikely for Irene and Jason to have found what they were looking for just by visiting a couple of libraries. The characters are well drawn and the interactions are interesting. The author has managed what few can; every character has a distinctive voice; the otherwise third person narrative is interspersed by bits and pieces of story from almost each character's point of view. The reader begins to care for them. The language varies too, in that you can tell from the words if it is the woman talking or the slave or the foreigner. And most of all, what I love (love!) is Emily Bottleshaw's poetry, and I'm not the biggest fan of poetry, so that is saying something. Let me go back to the descriptions, the India of the old is so quaint. While present day imagery is funny and altogether relatable, as Irene and Jason travel around the dreaded streets of Delhi in a rickety rickshaw, the train travel and the roaming around in the rain on rented bikes with people staring; the past has an overpowering charm. It is also aptly gory back then, with the brutal killings and rapes. And strewn over the book are descriptions that really stand out; like, a dried up river resembling a shriveled snake skin: doesn't that just make you smile and nod in agreement? What I didn't like: Here come the bads, which are, to be honest, just one big bad. Most of us tend to overlook our own mistakes, we just don't notice them; I bet I've scattered a few along this review too. But isn't that why we have editors? For starters, almost none of the quoted questions end in question marks. Then there's this: I'm pretty sure the word "riff-raff" appears about half a dozen times; once, it makes a good description; but repeatedly using the same words is just distasteful. A single paragraph contains the word "trusted" in every line, and another the word "kind"; not cool. In some places, there are extra words that are entirely out of place, probably forgotten there after modifying the sentence, and some sentences start out okay, jumble up along the way and end up missing a key preposition or a pronoun. Which reminds me, for some reason the author often uses 'it' instead of 'they', I could quote a few amusing examples I jotted down but I don't want to seem too fussy. Finally, the chapter titles are wholly superfluous. The difference between a badly written book and a badly edited book is obvious to the observant reader. The Great Mogul is certainly the latter, which makes the mistakes all the more frustrating. Another thing I noticed is that the story progresses in short scenes and when the writer is seemingly at a loss for how to proceed, the scene abruptly and conveniently ends and a new chapter begins. It's a style of writing I don't mind in this instance, but unless intentional, the plotting needs work. Conclusion? One thing is for sure, this is a book I'll re-re-read. And I will watch out for more of the author's works, hoping and praying that they are well edited! 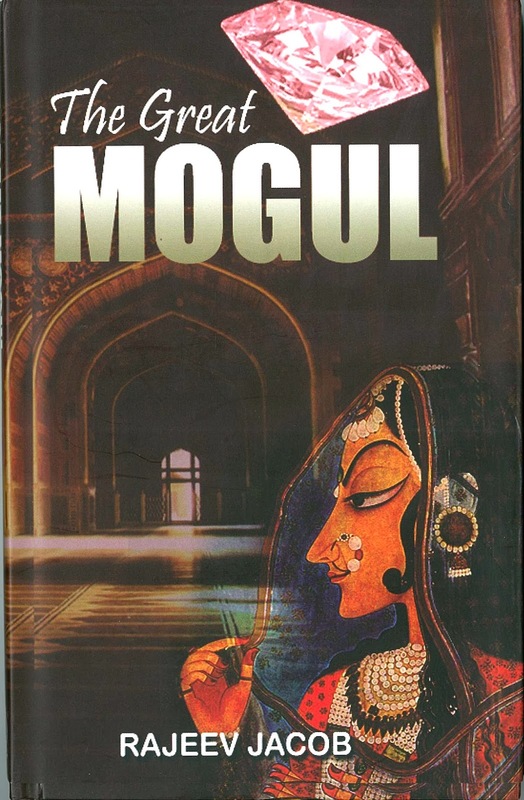 Meanwhile, you can grab your copy of The Great Mogul by Rajeev Jacob right here. Sounds an interesting book. A decently edited book coming from a debut Indian writer is too much to ask these days. I know, that's a shame, right? But the book is pretty good in spite of that! I read the book> It is really a thriller, with all intrigues and mystery. ^ I agree, it's very intriguing! Definitely worth a read! Some solid research has gone into the book, and it shows. But history delivered to the reader in chunks, as part of conversation, could have been avoided. Some other means should have been devised for that purpose. Found it a decent read.